"Walkout! 1968 and 2018 School Walkouts"
It's 1968 and 18-year-old Pemon Rami, a recent graduate of Wendell Phillips Academy High School, stands in front of the Umoja Black Student Center in Bronzeville. He stares off into the distance, quiet, determined. Behind him, a poster with an illustration of Malcolm X preaches unstinting devotion to radical change, challenging viewers: "He was ready! Are you?" It's 2018, and 68-year-old Rami stands before a photo of his younger self. Plenty has changed in those intervening years. A half century has softened his features and grayed his short-cut hair, but his presence remains self-assured. Though his own revolutionary moment has long since passed, he still believes that revolution belongs in the hands of the young. It's why, after a long career as a playwright and producer and as the director of educational services and public programs at the DuSable Museum of African American History, he now consults with groups such as Peace Warriors of North Lawndale College Prep High School and Fearless Leading by the Youth, hoping to pass along hard-earned lessons to those young people fighting today. "You get to that point where you're no longer capable of having the kind of battles that you had when you're younger," he explains. "I think it's important that young people understand that it is their responsibility to be involved. It's not something you can bargain with." But the bonds of solidarity that inspired Rami and his friends to launch a series of student walkouts to protest Chicago Public School's racist policies—a protest movement that eventually included 35,000 students—live on in every student strike today. 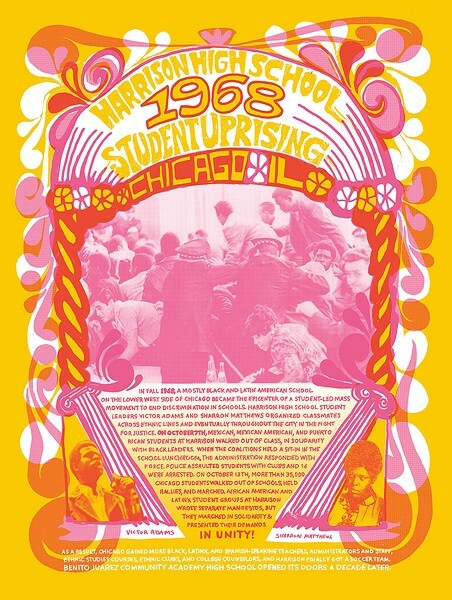 The past five years have seen a wellspring of student activism in Chicago and beyond, actions that hearken back to the unrest that transformed society 50 years ago. In Chicago, it was Mayor Rahm Emanuel's proposed closing of more than 200 schools in 2012—intended to save $43 million annually—that first sparked resistance among teachers, parents, and students, an energy that carried forward into the Chicago Teachers Union's successful 2013 strike. In the end, 50 schools, not 200, were closed. (A 2018 study at the University of Chicago found that the closures had had no educational benefits, and CPS has not commented about whether the move did, indeed, save the district money.) 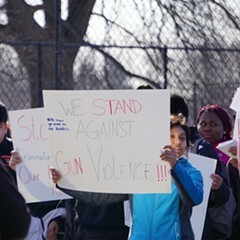 In the last year, Englewood students have protested the proposed closure of four neighborhood high schools. Everything changes, and everything stays the same. As Rami and others look back on their youthful accomplishments, organized actions that resulted in massive concessions from a school system that systematically denied Chicago's black and Latino youth the resources they needed, they're all too happy to help today's youth see the connections that remain between past and present. They've been aided in their efforts by CPS educators. Together, they offer a potent reminder of what young people can accomplish. The 1968 high school walkouts were an expression of growing dissent among the city's black and Latino student population, and a reflection of a wider climate of protest that permeated society at large. Years of disinvestment by Chicago Public Schools in the education of nonwhite students had created significant barriers for these students: there were few bilingual teachers, and the curriculum didn't represent their experiences. In 1968 they went on strike, pushing beyond the adult-led actions of previous years and defining their own terms of action. Mass protest within the Chicago system wasn't new to 1968. Just five years earlier, the city was roiled by ongoing actions against the school board, which, as Chicago's black population spread to the west side, continually redrew school boundary lines in order to prevent integrated schools. While many white students attended classes in underenrolled schools, black and Latino students were crowded into converted mobile trailers, dubbed "Willis Wagons" after CPS's segregationist superintendent, Benjamin Willis. 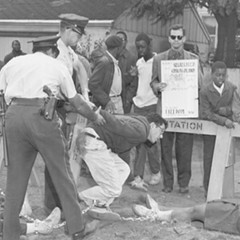 The 1963 protests culminated on October 22, which protesters called Freedom Day. That Tuesday, more than 200,000 students left their schools and joined marches from all over the city toward downtown Chicago. While the mass gathering demonstrated the overwhelming frustration felt by the city's growing black population, it failed to dent Mayor Richard J. Daley's support for continued school segregation. The use of Willis Wagons would persist, and while it initially appeared that Willis himself might be forced into retirement, he would ultimately remain in office until 1966. Though the protests were unable to unsettle the entrenched racial segregation that permeated Chicago, they instilled a spirit of resistance that persisted throughout the decade. Thanks in part to the Freedom Day actions, Martin Luther King Jr. chose to make Chicago the first city where the civil rights movement would challenge de facto segregation in the north. 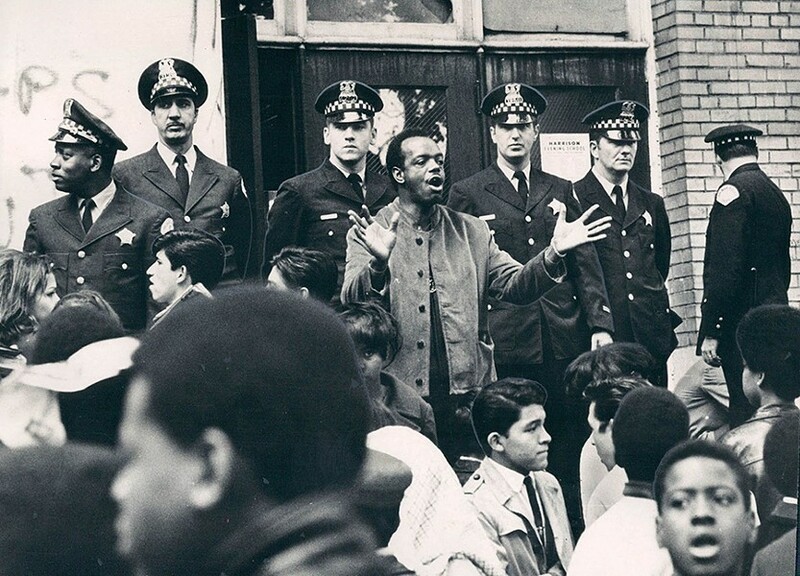 In 1966, Rami, then 16 and a student at Wendell Phillips, saw King speak at Stateway Gardens, one of the public housing projects that lined South State Street in Bronzeville. "I was mesmerized," Rami remembers. "And then he said at the end of the speech, 'We're gonna march to Cicero and Gage Park and Marquette Park,' and I went home. We knew what he didn't—that our lives would be excessively in danger had we done that." Rami wasn't the only student caught up in the activist spirit of the time. Student dissent sharpened the following November when history teacher Owen Lawson was ordered to leave Englewood High School and report to the Board of Education after he began teaching black history and leading the Afro-American History Club. In response, several hundred high-schoolers staged a walkout demanding his reinstatement as well as the introduction of formal black history courses. It was the first student-led action within the schools, and demonstrated a larger interest in Black Power politics less concerned with integration than black self-determination. In the summer of 1968, Rami traveled to Philadelphia to participate in the Third National Conference on Black Power. At the conference, he and Masequa Myers, who led the protests at Calumet High School in Auburn Gresham, copresented a discussion about youth organizing at a gathering of high school students. (The two would be married seven years later.) The two recognized the need to unite the different school organizing efforts happening across the city, a decision that would pay off several months later. The first student walkouts of 1968 launched on Monday, September 16, sparked by the principal's refusal to meet with students and discuss their desire for a better curriculum and a more representative teacher population at South Lawndale's Harrison High School. More than 500 students walked out that day, and after protesters felt the school's response was inadequate, approximately 1,000 walked out the next. Sharron Matthews was the vice president of New Breed, a black student group, and on September 18, she and New Breed president Victor Adams were suspended for their involvement. Adams, who was 18 at the time, was also arrested. "They thought for a long time that we had adults telling us what to do, but we didn't," Matthews says. "This is what we came up with in our group, because we saw an injustice and wanted to fix it. " The school was relatively quiet while both students were under suspension. But upon their return on October 3, Matthews and Adams presented a manifesto to the principal drafted by New Breed, demanding a meeting with school administrators the following day. When the principal refused the meeting, more than 250 students led an occupation of the school's lunchroom on October 7, eventually marching to the Chicago Board of Education after police broke up the demonstration. (That same day, students at Austin High School, apparently without knowledge of what was happening at Harrison, launched their own protests, demanding that a school with 48 percent black students be staffed with more than one black teacher.) While each of the schools involved in the demonstrations of the next several weeks had its own specific issues, the New Breed manifesto is representative of the fiercely independent outlook espoused by black students across the city. "We demand freedom and justice now," the manifesto declared. "We . . . feel that the curriculum fails to meet the needs of the Black students." The manifesto demanded the hiring of black teachers and administrators, the introduction of formal black history courses, insurance for student athletes, and the recognition of ethnic student groups in schools. 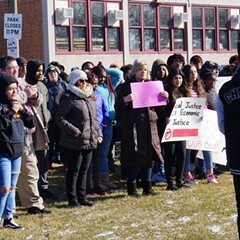 Latino students at Harrison, organizing in concert with black student groups, had their own list of demands, including bilingual educators and counselors, a Spanish-speaking assistant principal, and two years of mandatory Latin American history education. A city youth welfare street worker pleads with students to go home after a walkout at Harrison High school on October 9, 1968. Police line the school entrance. These actions at Harrison caught the attention of students on the south side, including Rami and Myers. The decision to unite the various student activists in schools across the city would prove valuable, as "Black Monday" protests throughout October forced the Chicago Board of Education to collectively negotiate with student leaders. On Sunday, October 13, students from 13 high schools and several nearby colleges met to coordinate their activities and distill a list of 12 demands common to the different schools' manifestos. The next day, the first coordinated walkout saw 35,000 students leave their classrooms. Walkouts continued throughout October. On the 28th, students marched to Civic Center Plaza, where Adams, Rami, and several other students theatrically smashed a wooden coffin labeled "Board of Education." Bowing to the ongoing pressure, the school board voted six to five to meet with student leaders on October 30, conferring official recognition on the students as representatives of their schools. The school board also agreed to immediately hire black principals at seven schools. In spite of their young age, many of the students involved in these protests faced violence and intimidation. Matthews's younger sister, after being identified as her highly visible older sibling's relation, was thrown down the stairs by a police officer at Harrison High School (she suffered no serious injuries, only minor bruising). On November 4, efforts to stage further sit-ins within several school cafeterias resulted in 26 arrests. Thanks to those arrests, the growing pressure of outside groups on the student-led movement, and the students' success at bringing the school board to the table, the Black Monday protests finally came to an end. Through a FOIA request, Rami later discovered there had been extensive police monitoring, including by the CPD's notorious "Red Squad" that infiltrated the high-school student movement. Ironically, it's in part that police activity that has allowed Rami to remember many details of these actions, a product of rigorous notetaking by an infiltrator during the student actions. "If it wasn't for the FBI, I wouldn't have all the materials," Rami says. In spite of the repression students faced, their actions led to the implementation of many crucial student demands. CPS hired greater numbers of black and Latino teachers, counselors, and administrators, and allowed the creation of ethnic studies classes and clubs. Harrison High School received funding for a soccer team that would win the state championship in 1973. And in 1977, after further protests that stretched into the early 70s, Benito Juarez Community Academy opened in Pilsen, fulfilling demands for bilingual education that parents had been making for decades. 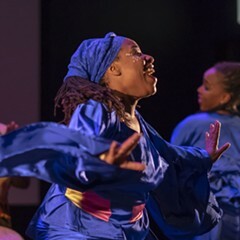 Even as poor communities of color continue to face deep-seated racism within Chicago's public schools, Rami believes that the 1968 protests have had lasting impact, despite the intense opposition that endures today. "I think that your legacy is defined by what you do, not by what someone does to contradict it," Rami says. "What you hope is that some young people will believe that the struggling, being a community organizer, being dedicated to improving the quality community, is their responsibility." Since learning about the student uprisings from another teacher five years ago, School of the Art Institute of Chicago education professor Nicole Marroquin has plunged headfirst into the existing documentary accounts of the actions, producing a psychedelic-tinged poster highlighting the protests that's been shown in numerous Chicago galleries throughout the year, including currently at Uri-Eichen Gallery alongside work by Rami. For several years, in partnership with Juarez teacher Paulina Camacho, she taught students about the organizing work that helped to build their school and fostering their understanding of these earlier youth-led movements. "[The students] were being regarded as less than human, and their history and their beliefs and interests weren't [being held to be] actually valid or worth examination, and the students had enough," Marroquin says. "Thankfully for us, they stood up and said, 'We're not gonna take it anymore.'" Marroquin's classroom practice was relatively hands-off. Rather than lecturing students about the history of the protests, she instead gave them access to primary sources, including yearbooks and press clippings, to allow them to make their own connections. Students have created a series of collages that may spur further inquiry into the protest's history, while leaving open the possibility of radical change in their own lives. "I'm not interested in trying to portray history as this objective thing," Marroquin explains. "I'm just like, 'This is the evidence we've got, here are primary sources for you to work on.' The more investment that young people have in their education and the kinds of things they're learning, the better it's going to work out for them in the long run." Through this process, Marroquin's students have raised their own questions about the enduring significance of student activism. One of the critical catalysts of the '68 protests was the fact that Latino students were designated as white until 1973, allowing schools like Harrison to "integrate" without transforming racial inequalities in education. Recognizing the black and Latino coalition building that deepened protests in the 60s and 70s, students began questioning why Juarez was almost 95 percent Latino, while Collins High School, three miles away in Douglas Park, was almost 100 percent black. 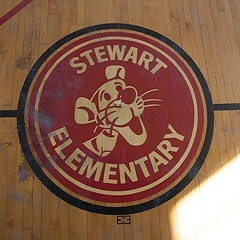 Their inquiry led students to print a blown-up image of two black students standing in a stairwell at Harrison in 1984, the year it closed, and paste it up in the school hallway, a guerrilla protest against the resegregation of poor communities of color; their own school is now majority Latino, while other schools not too far away are majority black. Even as today's students confront a half century of retrenchment and ongoing segregation, the students who fought in the 60s to transform Chicago's schools represent a vision for change that's as necessary to revisit as ever. Though systemic racism continues to limit black and brown futures in Chicago's classrooms, school protests reveal a structure that's more fragile than it often appears, capable of transformation when the lessons of history are applied to contemporary battles. 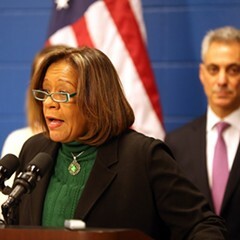 Thanks to their experiences during those pivotal years, former students like Matthews—who's gone on to an extensive career in public service, including serving as COO of Prologue Inc., a community-based organization that runs several alternative and charter schools in Chicago—hope their experiences can carry onward into a new round of purposeful unrest.